Generally he is very good, but on the rare occasion he can lose his cool. Here is a snippet of our very recent conversation. “Nikki, I’m not losing my patience,” says mild mannered Charlie. “Yes, you are. You yelled at me when I hit the erasure button,” I lamented. “Well, what we’ve been programming for the last three hours just went in the garbage can,” replied Charlie with spittle running down his chin. “Well, it’s not my fault. The machine makers need to do better with their instructions. I don’t see why stuff can be erased by simply pushing the erase button,” I stated, ignoring the spittle. Through clinched teeth Charlie goes back over the whole procedure of recording music, putting in phone numbers, etc. Then, and I swear this is true, he started explaining to me about Eniac, DOS, Binary, Octal and the first computer he purchased from AT&T back in 1987. That’s when my eyes turned blank and my breathing started slowing down. Actually, smoke signals are looking pretty good right about now. Palestine- Texas Monthly added Davey Dogwood Park to their bucket list, shouldn’t it be on yours? In the article, “The Bucket List: 63 Things All Texans Should Do Before They Die,” Davey Dogwood came in at #56. 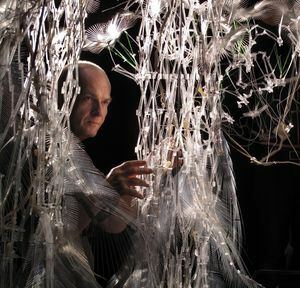 Palestine, Texas – The world-famous Philip Beesley Hylozoic Series exhibit will open on November 21, 2014, in Palestine, Texas. This exhibit, as seen on CBC News, is part of the world-famous Beesley Hylozoic Ground exhibit series that is an international sensation in such countries as Italy, Canada, France, Spain, Germany, Norway, the Netherlands, New Zealand, Australia, Taiwan, China, and Korea. This will be the only U.S. location for the exhibit series outside the Leonardo Center for Exploration in Salt Lake City, Utah, the original U.S. location. I love it! Funny, I was just thinking the same thing about smoke signals the other day. Don’t despair, I have a 12 yr. old dog who just learned her first trick–she can give me a “high five”. Every time I look at her I think there might be hope for me yet !!!! !